When most beer geeks get serious about beer they start a beer cellar to age their high ABV beer. Again as a beer geek knows this can build flavours while mellowing the strength of the alcohol in the flavour. Beers can really morph into a whole different animal with age for the good or the bad. There are a few enemy’s of beer when you age it though. There is light, temperature and oxygen and all can have a significant effect. Light can be easy to control as you can turn off the lights and temperature can be easy by finding a place in your home that does not fluctuate in temperature much from season to season. The one enemy that can be hard to protect against is oxygen. Some breweries either cork their beers that age well and some wax the top of the bottles. Many breweries do nothing though and this can be like playing Russian roulette with your beer and depending on the beer that could be an expensive game. A fellow local blogger got me onto the idea of waxing my own bottles to protect them for the long haul. Jason of Beer Scout posted a little blurb on waxing and I decided to expand it a bit with this post. 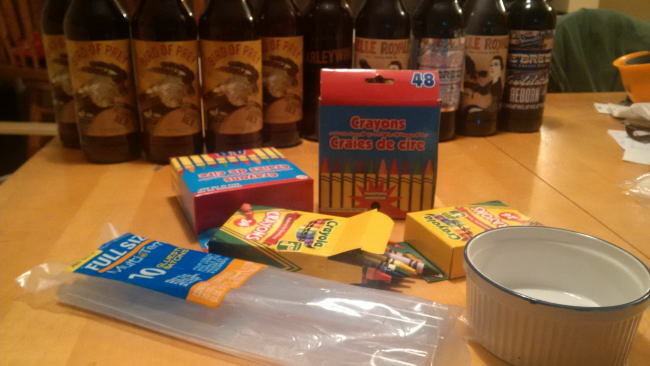 You will require equal amounts hot glue to crayons to make your waxing solution. Make sure when you start that all beer to be waxed is at room temperature as my first batch was cold and half of my wax seals cracked. Start by preheating your oven to 350C. While you wait prepare your crayons by removing their paper covers. I had large hot glue sticks and used two in my dish. I then placed 8 crayons of similar colour into the dish making an approximate 50/50 split. Once the oven was preheated I placed the dish into the oven and heated. Watch the oven closely as to not over bake the mixture. Once everything is melted take your dish out of the oven and mix everything very thoroughly. This will turn out horribly if it is not mixed well. Once everything is well mixed place the bottles into the mixture and coat the cap area of the bottle making sure it is well sealed. Do not take your time as the mixture will be cooling down as you do these steps. Oh yeah turn off the oven if you haven’t yet. It is really that simple. I would recommend a container that is taller and skinnier than the one I have if you would like a more full wax seal like most commercially waxed bottles. Not sure if they are better but it does look better. Now go out and try it for yourself just be careful as the wax is at 350C! This entry was posted in Gadget and tagged age, aged, aging, beer, bottle wax, bottle waxing, craft beer, crayon, crayons, hot glue, hot glue stick, hot glue sticks, oven, paraffin wax, vinates, vintage, wax, waxing. Now there’s an idea, especially for home brewing. Really is. Especially if you can make sure no oxygen hits your beer while bottling. Do you have any scientific basis for this? I think it is a beer collector’s urban legend that wax dipping does anything to “protect the beer from oxygen”. For a start, wax is oxygen permeable, so if the cap has a bad seal the wax isn’t going to help. Secondly, the contents are under pressure and the “air gap” at the top of the bottle is mostly CO2. Unless something is wrong with the cap, oxygen isn’t going to get in. The usual cause of beer oxidizing is NOT that oxygen has got in during storage. If this was the case, the beer would be totally flat way before it oxidizes. This is not usually the case when people discover a bottle to be oxidized. The real cause of oxidation is that it oxidative reactions are always happening in a beer – inevitably there is always some oxygen uptake during the brewing & bottling processes. This process is accelerated by heat and movement. That’s why heat is the number one enemy to cellaring beer. Note that oxidation happens a little differently in complex, dark, strong ABV beers that contain a lot of unfermentable sugars. These sugars oxidize to compounds that give a sweet, sherry-like flavour and aroma, which often works well with those beers. Lighter, less complex beers, however, will develop a paper/cardboard/lipstick type flavour – never pleasant in a beer. If you aren’t convinced, try an experiment – take two bottles of a beer you really like, wax dip one and leave the other untouched. Keep the non-waxed one in a fridge or temperature controlled cellar (below 16C). Put the waxed one somewhere warm (25-30C). Give it a few months, and compare. You’ll quickly learn the wax didn’t help at all, whereas the cooler temperatures maintained the beer flavour well. Now this doesn’t mean there aren’t any benefits to wax dipping your bottles. There are a couple – firstly, it looks cool. This is why breweries do it. Also, it can help protect the bottle from moisture, which could rust a badly made cap and lead to spoilage (incidentally, this is why some wines and spirits are waxed – to prevent mold & moisture getting to the cork). Finally, it will help keep the cap in place when transporting the beer. People who trade beer regularly have started getting into waxing for this reason. In summary – wax your bottles so they look pretty. Just don’t fool yourself into thinking it protects the beer from oxidation in any way. Hey Simon. Everything is bit oxygen permeable but I will take my chances like many that this will help the beer. I think it would be a better experiment to actually store both beer at the same temperature. This will ensure that they have the same control.